I need help in breaking two people up. What kind of conjuring powder would I use to permanently separate these two people by showing the true colors of the other person. Is there a particular spell that will allow me to expose the truth about a person who practices hoodoo and may be protected? how do you know they practice hoodoo? there are a million magic systems in the world. Also does this seem to apply to the situation and work. readings often can tell if they practice. If your situation is as complicated as dealing with a worker and also breaking a couple up, which id assume is cuz you want the person id strongly suggestion a reading from an AIRR reader and ask them what work to do...some even offer magic coaching where they walk you through the spells that you do, its like hands on training. Thank you, yes I know because this person is a little bit to close for comfort in my family. It is a male, he has mentioned it out before out loud. I guess he was trying to scare us, or not think that no one was listening, but I found the licorice root stick all bent up in his pants pocket a year ago. I just don't know what to do with it. He has even mentioned the place out loud were he visits, here in Texas. So I know he is up to no good. Primarose220 wrote: I found the licorice root stick all bent up in his pants pocket a year ago. I just don't know what to do with it. Take a couple splinters off it and put them in a doll baby.These would serve the same purpose as his personal concerns IF you could get them. Then stuff the doll with hot-and-painful things (red pepper, black pepper and other unpleasant herbs.) Next, burn the rest of the root, calling on God to destroy his evil, controlling power "just as this root burns." Next, blindfold and hogtie the dollbaby -- and then beat, abuse and punish it just as you see fit. Be sure to tell the Lord that "All I want to see is justice," and take a hyssop bath afterwards. Last edited by MissMichaele on Mon Aug 05, 2013 9:33 am, edited 1 time in total. What happens if I put the red and black pepper on the licoricie root as a I burn it? Should I use a candle, and if so what kind? The suggestion to use the piece of the licorice root is very good, Miss Michaele. See also the earlier thread on Licorice Root Questions and Answers for more on this situation. Primarose220 was told to try a Hot Foot spell to remove the problem person from the home. . I have a friend whose girlfriend is attracted to the good life my friend has to offer and refuses to leave. It has become very obvious over the last few months that her attraction to my friend is financial and not really romantic. My friend has come to realise that too but is soft hearted and just a good person and is not strong enough to just be firm and show her the door. Any ideas on how to get this moocher away? Having looked through the forums, I am thinking perhaps a moving candle spell to attract this girl to a new and wealthy love.... Any other suggestions would be much appreciated. 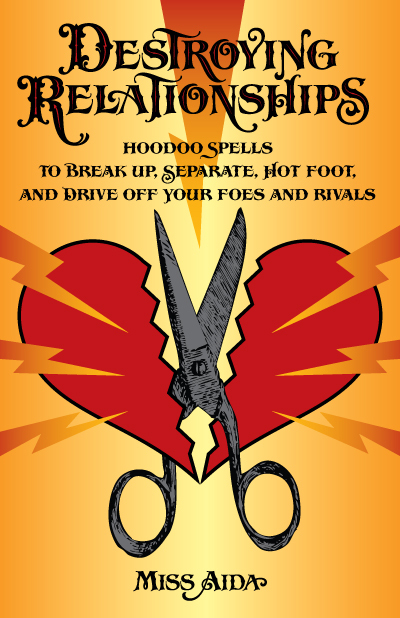 I have a variety of lucky mojo products I can use, including break up and hot foot powders to try and break her up from my friend and move her to someone or something else shiny! Gurl, I feel you on this. You care about your friend, and you don't wanna see him hurt. I get it. I really do. I honestly can't count how many times my best friend has shacked up with someone for all the wrong reasons. He's one of those chronic daters--always gotta be in a relationship. Although, I may not agree with his choice in dates, I don't cause any trouble for them. It's more important to understand that I don't have to support my friend's decisions in order to support my friend (make sense?). If your friend knows this girl is a "gold-digger" and is okay with that, then I maybe you should be, too. I mean, honestly, if she's as bad news bears as you say she is, then she'll eventually end up Hot Foot'n herself right outta the picture!! Then you can have the satisfaction of giving your friend the "I told you so" look, and laugh about it later. Just because we have access to magic, doesn't mean we always have to use it. Part of the wisdom in being a strong Conjurer is know when to hold 'em and when to fold 'em. But, if you are absolutely ITCHING to do something (Lol!! ), I would suggest using King Solomon Wisdom products to give him the mental clarity and conviction needed to make better decisions. I hope this helps ya darl'n!! Help see the truth so they break up? I want my target to break up with his g/f. She is cheating, lying to him and is also causing problems for his family, but either he can not see this or he doesnt know or he's an idiot. They broke up once before when he found she cheated the last time. Since he now complains about not really being happy in the relationship anyway, I thought about doing a vinegar jar to break them up since those work well for me usually. Then I thought (which was validated by a reading I got from one of the AIRR readers here) that if I break them up it might not stick for long (also has happened to me before), in other words, we would get together and he would dump me to go back to her eventually. I didnt want to force him to be with me since he already has interest in me and I think it would happen on its own if she was not in the picture. I just want the truth to come out, even if its explosive (a tower card moment if you will) and for him to have the strength to leave for good and forever. So now my idea (which my reader agrees with) is to do a skull candle to help him see and hear the truth about her. I thought of annoiting it with Clarity oil and King Solomon Wisdom oil and maybe Crucible of Courage oil so that he could find out the truth and have the courage to leave because maybe he is aware but is afraid to be alone. I dont know; does this sound good to you guys? Has anyone done anything else for the truth of things to be revealed or come out? I am worried about it actually working. I dont know if I am going about it the right way but its the only thing I could come up with. Is there something else i can do for this or another oil or herbs to help with it? Any suggestions are greatly appreciated!! Re: Help see the truth so they break up? To break up a couple is serious business and may take more than the truth simply coming out. You may want to add the concept of them being hot-tempered and irritable when the truth comes out, so they do not forgive. I have merged your question into a longer thread with several other tricks and spells mentioned, to give you an idea of a few traditional "compell the trth" type spells. Primarose220, I apologize for not replying earlier; I just saw your question. What happens if I put the red and black pepper on the licoricie root as a I burn it? It would inflict further pain, I'm sure. I meant you to stuff the doll baby with it, but you could do both. Should I use a candle, and if so what kind? Depends on the effect you want: Reversing, Hot Foot -- or, if he's really vicious and you have signs that it is justified, Damnation or Destruction. There are other spells you could use to ruin his health or run him crazy; many of these call for the appropriate personal concern (sexual fluids, hair, feces) to be applied to the end of a twig, which you jam into a hole you have bored in a tree. Work of this kind would make it more difficult to fight back. I just came across this thread and I have a few questions. This man and I were involved early in 2014, but no one knew about our "relationship". We have been friends for many years and we work together part of the year. In April he began dating another woman. When we began working together he would flirt at times and then on the last night we worked together he called me when I got home and asked me to meet him. We talked and were intimate that night. The next week he once again approached me when we found ourselves alone and we were intimate again. I was hoping he was going to split from the other woman, but now it looks like he may have proposed to her. The woman he is seeing bought a house beside him about a month after they began dating which I thought was rather rushed. I would like for her to know so that she would leave him, but I can't tell her because no one knows but the two of us. Does anyone have any suggestions. I know this situation doesn't make me sound like the best person, but I really am a good person. I just want him with me and I deserve to have happiness with him. He was divorced from the mother of his two children years ago and was engaged one time after that that he broke off. His son and I are close and he calls me his other mom, but he doesn't know about his dad and I.
bb9, read j82's post, it links to the type of spellwork you are inquiring about. I want to know what spell can I get to make this girl tell the guy I want she's using witchcraft on him and in the process break them up I also want him to expose her for it. I guess he'll do that automatically. I'm planning on letting my airr rootworker do it I just wanted an idea of it. If you are having an AIRR worker do the work for you, why not let them design your course of action as well? They will do a reading to assess the situation and then can advise on what work should be done, so I would defer to them. The posts in this thread can give you ideas of what could be done, but your rootworker is the best one to advise you on what should be done. "I have merged your question into a longer thread with several other tricks and spells mentioned, to give you an idea of a few traditional "compell the trth" type spells." I don't see any spells(here) to compel one to tell the truth. And yes, I've looked. Matter of fact I've read all of it. Go to your profile page and click on the link to your posts and scroll down until you find the post you're looking for. Click on it and it will take you to the thread where that post was re-homed.